Season’s greetings from Shenandoah Terrace Memory Care! The owners and staff of the Terrace would like to take this opportunity to express our appreciation to our residents, their families, and the community for the support you’ve shown us throughout the year. As the New Year approaches, our family wishes you and yours a prosperous year filled with joy, laughter, and love. After a visit to Shenandoah Terrace, we’d love for you to stick around New Market and explore more of what our local community has to offer. In the winter, we recommend settling in to a cozy restaurant for a hearty meal, or taking advantage of the free services that the town provides to residents and visitors alike. For the most iconic New Market dining experience, visit the famous Southern Kitchen, which has been open since 1955. Order a breakfast dish with country ham, or drop in for lunch to enjoy some fried chicken. Other popular dining destinations around town include Jackson’s Corner Café and Coffee House, Miller Grill at the Shenvalee, and Kathy’s Home Cooking Café. The New Market Area Library is also a great place to spend time on a cold day. Open in its current location since 2008, the library is staffed entirely by amazing volunteers. They offer children’s and adult programming and community events, as well as a nice place to sit and read. The New Market Community Center, housed in a former middle school building, is also worth a visit for one of their popular events. It frequently hosts craft shows, and is sometimes open for activities such as concerts or open gym sessions. For information about their programs, find the Community Center on Facebook. To kick off the 2018 holiday season, we gathered several of our residents for a fun afternoon decorating gingerbread houses. The houses came in easy-to-use kits with lots of sweet treats to make them festive. 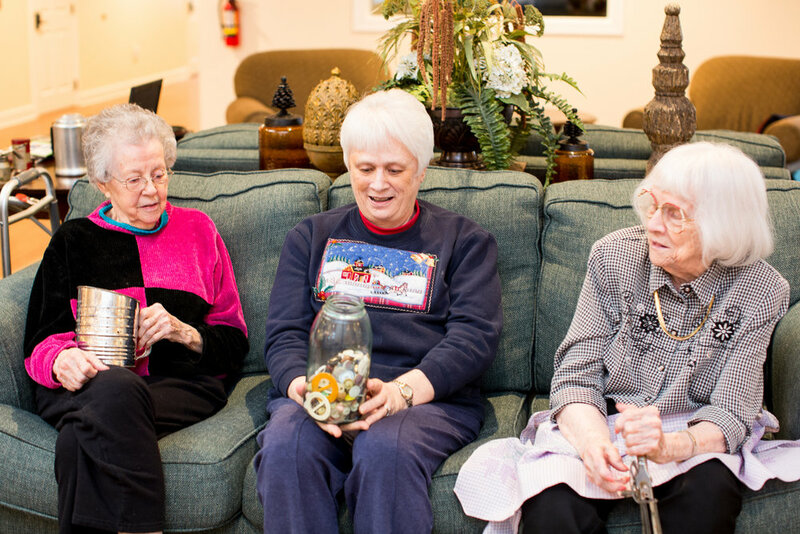 With help from our staff, residents chose gum drops, candy canes, peppermints, and more for their holiday designs. This hands-on activity gave participants an experience that was colorful and tactile without being overwhelming. The candies and gingerbread had different textures and pleasant scents. As you can see from the photos here, most residents pitched in to decorate their own gingerbread houses. It may have brought to mind holiday traditions or other good times, too. We had a lot of fun putting this treat together, and hope you enjoy the pictures. This month, we’d like to introduce you to Tiffany Marteney. She has been a CNA, or Certified Nurse Aide, at the Terrace for two years as of December 29th. Before joining us here in New Market, Tiffany gained experience by working at other local facilities. We’re happy to report that she “loves it” at Shenandoah Terrace. Tiffany moved to the Valley as a teenager after growing up near Deep Creek Lake in Maryland. Her mother decided to move to be closer to family, but Tiffany remembers it being a challenge to start at a new high school as a senior. These days, she lives in Broadway, with her mother in nearby Luray. Tiffany enjoys family trips to the Outer Banks of North Carolina, and crafting. She does amazing crocheting work, and showed off some of her recent creations during our interview for this article. We loved her pumpkins for fall and adorable winter snowmen. She has also picked up diamond painting, which involves using tiny gems to create pictures and is a little like cross-stitching. She frames the finished pictures and is giving her mom one for Christmas! She also spends time with her fiancé, who is from the Valley and works in HVAC. The couple has two cats named Speck and Lucky. Speck’s name came from a grey spot on its nose. Tiffany found Lucky as a kitten and took it in from the cold on a snowy evening. At Shenandoah Terrace, Tiffany is a big help with resident care. She works the day shift, and is often here for 8 hours at a time – so you may have seen her around! We appreciate all of the kindness that she adds to our community. In 2018, Veterans Day was observed on Monday, November 12th. But, did you know that all of November is actually designated as National Veterans and Military Families Month? 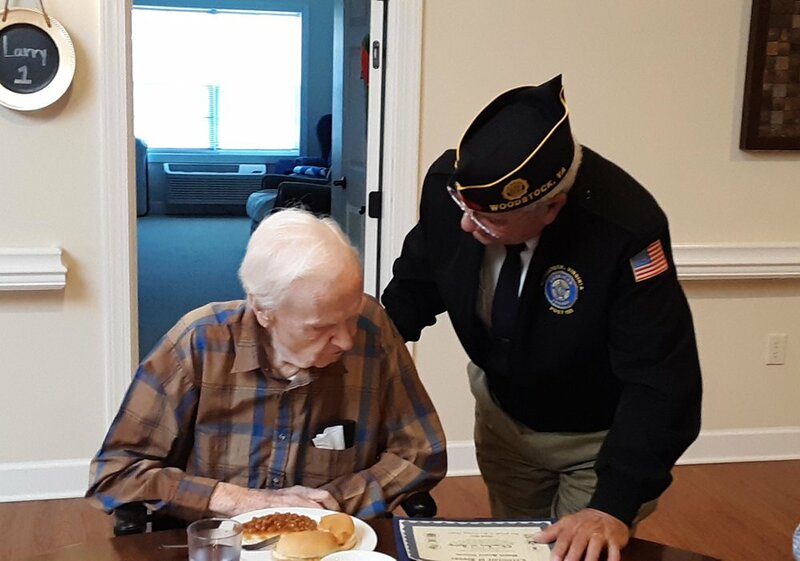 To celebrate this very special time, New Century Hospice visited Shenandoah Terrace and brought along award certificates for the veterans who are part of our community. Representatives from New Century set up a wonderful table with beautiful flowers in red, white, and blue, a display of American flags, and more. They made our dining area look so patriotic! 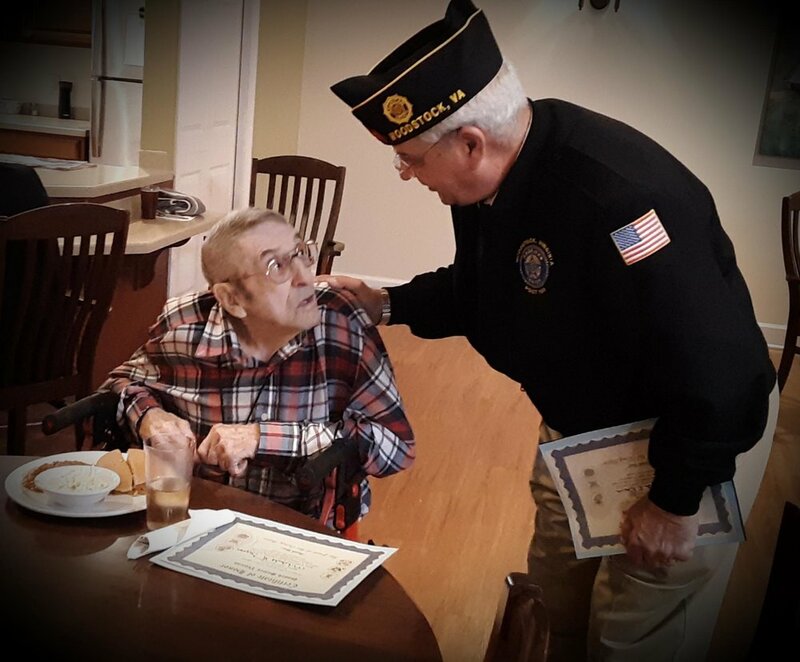 Residents Robert Driver, Mitchell Layman, William Green, and Charles Long were presented with awards for their service to our country. It was a pleasure to honor the veterans in our community. We thank them for their time in the armed forces, and would also like to thank those of you who have served. Fall is a busy season in the Shenandoah Valley. As people flock to visit the mountains and take in our beautiful surroundings, local events kick into high gear. In New Market alone, September will bring a Virginia Military Institute Parade, a puppy pool party, the Fire and Rescue Department’s Fall Fling, and our annual Heritage Days festival! You can find out about each of those events and more at the Town of New Market’s website – NewMarketVirginia.com. But we’ll fill you in on the Fall Fling, which is coming up on Saturday, September 22. The Fling is in its 13th year. Held at the New Market Fire and Rescue station, it begins at 11 AM and will wrap up around 5 PM. Burgers, hot dogs, sides, and beverages will all be available for purchase. The big draw for this event is its raffle prizes. This year, more than 60 prizes worth an amazing $100,000 will be up for grabs! Brand new vehicles and an $8000 cash prize are among the offerings. From 11 AM on, a winner will be announced every 5 minutes, with the grand prize drawing at 5:00. Tickets to the event are only $25. For more information about the Fall Fling, visit the New Market Fire and Rescue page on Facebook. You can purchase tickets at Napa in New Market, Rt. 11 Equipment, Grubbs Chevrolet, or Runion’s Hunting and Fishing. We hope to see you there! If you haven’t stopped by the Terrace lately, now’s a beautiful time to come see our outdoor spaces in bloom! Flowers, like the Black-eyed Susans pictured here, are brightening our community and bringing joy to our residents. The rocking chairs on our shaded porch have been a popular gathering place lately. Residents are also enjoying spending time in the courtyard and gazebo, and going for walks on our easily accessible paths. Our welcoming outdoor spaces have always been one of our favorite parts of Shenandoah Terrace, and we’re so pleased to see that residents agree. Take a picture “tour” with the images here, and then visit us in person when you can. Jennifer Stroop, a Registered Medication Aide at Shenandoah Terrace, is one of our longest serving employees. She first joined our community over at Shenandoah Place. In more than eight years there, she grew to love working with residents. When the Terrace opened, she made the switch to this facility and has been here ever since! As one of our five medication aides, Jennifer helps make sure our residents receive their prescriptions at the correct times and in the correct doses. But, she also pitches in with all sorts of activities that benefit our community. Jennifer grew up in Timberville and began her career as an optician. She was inspired to shift her focus to elder care when her own grandmother dealt with dementia. Displeased with her grandmother’s care, Jennifer visited her every day and tried to improve her situation. After her grandmother’s passing, she decided to dedicate her life to helping memory care residents. She’s still happy with her decision more than a decade later. Knowing that she’s there when they need her is Jennifer’s favorite thing about working with our residents. She builds relationships easily, and says that this is “where her heart is.” In addition to managing medications, Jennifer provides residents with calming tools, plays cards, and does puzzles in our community. She also enjoys late-night snacks and conversations with residents who stay up late. The hardest part of her job is losing people she’s cared for. When she’s not at the Terrace, Jennifer enjoys spending time with her boyfriend, Sherman, who owns a construction company. They usually visit every other weekend and enjoy activities like hiking to Crabtree Falls. She proudly wears a beautiful ring that he gifted her last Christmas. We’re grateful for all that Jennifer has given to our communities and hope you’ll tell her hello the next time you see her. For family members caring for a relative with dementia, the emotional burden of placing them in a memory care facility often is heavy. Coordinating placement can bring up feelings of mourning or loss, and has even been compared to experiencing a loved one’s death. The heightened emotions around placement probably help to explain why family members and facilities sometimes find themselves at odds. To avoid disruptive conflicts, it’s good to understand what causes them. Unrealistic expectations are often to blame. Without a comprehensive understanding of the geriatric syndromes that lead to memory care placement, aspects of the process can be upsetting. This is frequently true when it comes to one-on-one care. If families enter a memory care community with unrealistic expectations for the intensity of that care, it can result in anger and resentment. Navigating placement with reasonable expectations is good for facilities and families, alike. Many primary family caregivers continue to experience high levels of depression and anxiety even after placing their loved one in a facility. Improvements in their own social lives and favorable impressions of their relatives’ memory care did not significantly lower those levels. Dealing with dementia is never easy, but well-managed expectations can make it less stressful. If you haven’t visited New Market in the spring before, you’re in luck: it’s shaping up to be a beautiful season! Our porches and walking path here at the Terrace are looking greener and greener, and many of us are enjoying the opportunity to spend a little time outside. To take advantage of more of the Shenandoah Valley’s best outdoor offerings, we recommend a trip into Shenandoah National Park. The wildflowers there are in bloom, and can be seen along the over 500 miles of trails open for walking or hiking. If you prefer to travel by car, you can also drive along Skyline Drive. This beautiful, scenic route is open 24 hours a day, 7 days a week and is an easy way to take in lots of stunning views. Animal lovers may also appreciate the opportunity to observe black bears, deer, wild turkeys, and more in the park. On its website, you’ll find tips for seeing wildlife safely and photographing animals from an appropriate distance. The park encourages visitors to share images they’ve captured on social media. For more about Shenandoah National Park, visit their website through the National Park Service. We hope you get a chance to visit or explore our beautiful region, soon. but you are never gone from my heart. Back in April, we gathered our residents for a relaxing and fun sensory activity. Using colorful, bright squares of fleece fabric, our staff helped them create easy knotted blankets. We’ll let our pictures tell most of this story, but notice how the squares are large and soft to the touch. The big pieces make for easier knotting, and eliminate the need for any kind of stitching tools. Our residents enjoyed this simple, yet stimulating activity. 1. Provide Calm Reassurance: If you can stay calm and collected while you’re addressing your senior, they’ll be more likely to stay calm, too. Try to keep your body landuage and tone of voice relaxed. Often, “I want to go home” is an expression of fear or worry. To ease those feelings, you can give a big hug if your older adult likes hugs, or gently stroke their arm. Stuffed animals, blankets, or therapy dolls may also be good, comforting choices. 2. Don’t Try to Explain or Reason: Though you know that your resident is already in their home, it’s not productive to try and convince them that they are. Trying to reason or appeal to logic with an adult in memory care usually leads to frustration. They may become increasingly distressed and agitated, and are unlikely to accept your explanations. They may start to believe you’re keeping them from doing something they believe is important. These strategies take some practice, but are worth learning. If you have questions or would like more guidance for addressing requests to go home, just ask a member of our staff. If you live in the Shenandoah Valley or are visiting our area in the coming months, you’ll find plenty of spring events to keep you busy. On Saturday, March 24th, for instance, New Market’s free Community Easter Egg Hunt will take place at 10 AM. While children under age 10 are invited to hunt for eggs, everyone can enjoy games and activities on site. If you attend with a child, please remind them to bring their own Easter basket for the egg hunt. In April, enjoy the annual Gardens, Galleries, & Grapes event in New Market and beyond. Shenandoah County manages this festival along the “O Shenandoah County Artisan Trail,” which includes dozens of studios, farms, vineyards, and more. Held on April 28th and 29th, the weekend offerings range from tours and tastings to demonstrations and exhibits. For more information as this year’s event is planned and vendors are added, check VisitShenandoahCounty.com. Dementia takes a person’s newest memories first. That’s why many of our residents remember people, events, or objects from decades ago, but cannot recall more recent moments. Relatively new items like smartphones, flat screen TV’s, and electric stoves may be exciting to some of us, but they can be confusing or upsetting to our residents. Instead of pushing people with dementia to adapt to the modern world, we believe in prioritizing their comfort whenever possible. At home, this can mean staying patient when “Mom” doesn’t push the right buttons on the remote or understand the cell phone. Here at the Terrace, it also means designing engaging activities that make the past fun! In late January, we held a reminiscing activity that made the most of our community’s affection for the past. 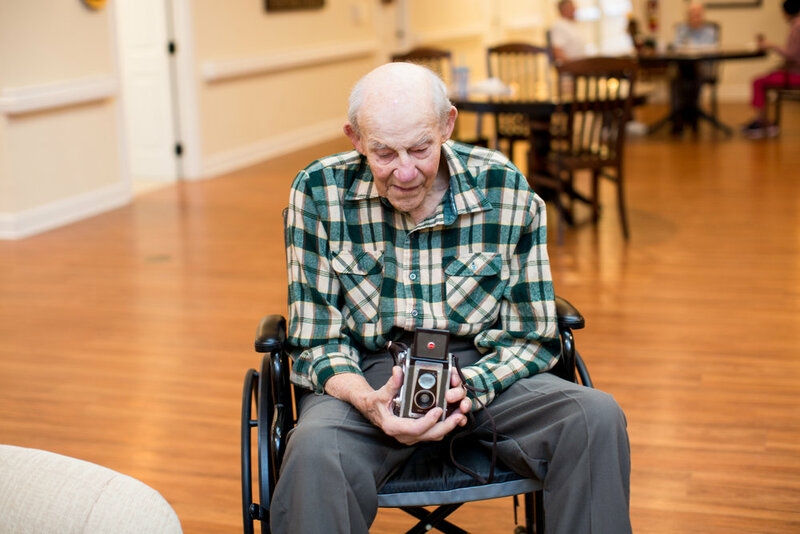 Residents passed around objects such as an antique camera, vintage cards, photographs, jewelry, sewing supplies, and old-fashioned kitchen tools. They were eager to demonstrate that they remembered many of these items and their uses, too. One resident turned an eggbeater. Another “took a picture” with the camera, aiming it from his waist as was customary with that model! When we reintroduce residents to familiar objects that they recognize and feel comfortable with, it makes for a great time. If you come across any items you think our community might appreciate, please feel free to bring them by the Terrace. With flu season well underway, we’d like to issue a few important reminders about how the illness affects our facility. A little prevention can help slow the spread of this serious illness. If you are having any flu-like symptoms or recently may have been exposed to the flu, please do not visit the Terrace. Flu can incubate for several days before and after its symptoms show up, and it is contagious during that time. Symptoms to look out for include: fever or chills, cough, sore throat, runny nose, body aches, headache, fatigue, diarrhea, and vomiting. If you do stop by our facility during flu season, please wash your hands and/or use hand sanitizer before and during your visit. Do not assume that a flu shot will keep you from getting or spreading the flu, as its estimated effectiveness is poor this year. Also note that it possible to get the flu more than once in a season by contracting a different strain. No one is completely immune. Please remember that, in the event of a flu outbreak at the Terrace, restrictions will be placed on visitation. This policy protects our already-compromised residents from other bacteria and viruses that could be brought in. It also helps limit the spread of existing illness. We take the flu seriously, especially because it is a virus with no real treatment. Though Tamiflu can be used preventatively or to lessen symptoms, it does not stop the flu from running its course. Our community appreciates your help and wishes you a healthy season. If you haven’t had a chance to visit New Market yet, there may be no better time than the fall. As summer winds down, local festivals and events really get rolling. September, for instance, will bring a parade, a puppy pool party, and two festivals in just one month! The New Market Heritage Days Festival, put on by the town’s Chamber of Commerce, is especially good for getting to know the New Market community. The festival is on September 23 this year, and will be held in our historic downtown. Local vendors will sell crafts, food, and more. Live music and other entertainment will run throughout the day, which begins at 9 AM. To learn more about Heritage Days and other happenings around New Market, check out the events section of the town website at: https://www.newmarketvirginia.com/visitors/festivals-events/. Since our last newsletter, we’ve been privileged to welcome six new residents. Please say a warm “Hello” to Paul S., Courtney W., Schollay P., Katherine C., Bill and Mae G.
We would like to thank the Women’s Auxilary of the Fraternal Order of Eagles, New Market, Virginia for their generous donation which will be used to enhance the quality of life for our residents. Our residents toss the ball to one another, and act out the actions as they catch. Everyone is a good sport about making the silly motions, and the game usually takes a funny turn or two! Games like “Toss and Move” benefit our residents in several ways, but we especially like how they make physical activity fun. When seniors are focused on having a good time, instead of performing a boring or redundant drill, they can enjoy exercise without even thinking about doing it. There are so many positive effects that daily exercise provides, particularly as we age. With that in mind, we try to include simple activities for our residents, every day! Stretching, walking, or a game of catch can go a long way to improve quality of life in our community. We hope you enjoy this piece that we found. It speaks to many of the rewards and challenges that come with loving family and friends as they age. In our February newsletter, we promised to give you some ideas about things to do in New Market. Whether you’re a local looking to take more advantage of our town’s offerings, or just have come to town to visit, we think you’ll be charmed by spring and summer in the Shenandoah Valley. If you’re just getting to know New Market, a self-guided walking tour of the historic downtown area is a great start. The local Chamber of Commerce and Town Hall each offer free copies of a Town Walking Tour Brochure. The brochure is also available for download on the town’s website, and will guide you through a pleasant site-seeing tour. To get your own copy, visit www.NewMarketVirginia.com/visitors. For locals or those of you who’ve already seen New Market’s highlights, the seasonal Farmer’s Market is another good option. The Market opens in May and operates every Friday from 2-6 P.M. This year’s season starts on May 19th, and will last until the weather cools off in October. You can find local produce, baked goods, meat, and more at 277 Old Cross Rd., which is behind the old Wine Cellar building and near 7-11. The New Market Rebels also begin their baseball season in May. On May 30th, they’ll host a “Meet the Rebels” picnic at 6 P.M. The picnic is held at the Rebel Park Picnic Shelter, and will give fans a chance to interact with players and team staff. The Rebels offer many themed nights and special events throughout the baseball season, so be sure to cheer for our home team. From the annual Cross Roads Fest to Civil War reenactments and the community pool, there is much more to explore around town this summer. We’re always happy to provide suggestions, but the town website is also a great resource. Stop by NewMarketVirginia.com and make your plans to visit. We hope to see you soon! Do you remember Pudding Pops? The dessert made its debut in a Jell-O recipe from 1967, and was especially popular in the 1980’s and 90’s. On a warm April afternoon at the Terrace, a group of our residents pitched in to make a batch of their own frozen treats. Preparing an old-fashioned recipe has all sorts of potential benefits for residents. Some participants might remember Pudding Pops specifically, and recall other times and places when they encountered the dessert. Others could be reminded of ice cream cones, chocolate, or just the feel of a cold refreshment. The process of stirring the pudding, scooping it into cups, and adding popsicle sticks might bring up memories for other residents. Of course, no single activity will stimulate memory for all residents, and that’s okay, too. Most of our pop-makers were still able to enjoy pleasant company, the sweet smell of pudding, and, eventually, the taste of a delicious Pudding Pop. We loved introducing this new activity to our residents, and look forward to telling you about more fun and stimulating times at the Terrace. If you’ve been following Shenandoah Terrace for long, you’ve seen our excitement at every stage of its development. This month, we’re proud to update you on the continued growth of our memory care community. In May, we will welcome our 18th resident. We’re pleased to have increased our residency so quickly, and happy to be serving a wonderful group of residents. But, we’re not finished growing. We appreciate your support as the Terrace has taken shape, and will keep you updated as we continue to help our community thrive. In the months since Shenandoah Terrace opened, we’ve enjoyed welcoming residents and visitors to our new community. Visiting family or friends with memory care needs is not always easy. To help facilitate even more fulfilling visits going forward, we’d like to share some helpful tips for preparing to visit the Terrace. Take at least five minutes before a visit to consider topics of conversation or activities you’d like to do. The visit may not follow your plan, but preparation can make things smoother. Expect periods of silence and tell yourself that you can comfortably handle them. Long pauses in conversation can be less awkward if you know they are likely coming. Plan your visit for a quiet, comfortable space in the community. A shaded porch, peaceful room, or a setting you think your resident will enjoy will get your visit off to a good start. Sitting and looking through a photo album may be a comfort and a way to strike up conversation. Remember the person you are visiting is not the person they once were. The more information you can share about your family member’s past will be helpful in their daily care. Be flexible and prepare to find small successes in the visit to appreciate. Holding hands in silence can make for a good visit. Looking at a flower or sipping milkshakes together can, too. We hope you find these suggestions useful. In upcoming newsletters, we’ll share specific suggestions for visits themselves. But, please feel free to ask us for visiting tips in the meantime. Our staff is knowledgeable and always happy to help. It’s been a real pleasure to welcome our residents over the past several months. Part of that pleasure has been getting to know some of you, as well. If you’re not from the surrounding area or just haven’t had a chance to visit New Market, yet, we hope you will be able to soon. To help you out when you plan a trip to town, we’ve included a handy list of resources below. They’re full of great information about what to do, where to eat, and what’s going on in Shenandoah Terrace’s neighborhood. By the time we send our next newsletter in May, the town calendar will be full of spring and summer events that we’re excited to share with you. In the meantime, we hope these links are a good introduction to our wonderful area. Enjoy! We prioritize resident health and safety at Shenandoah Terrace. Preventing the spread of illnesses is especially important this month, with flu season in full swing. You can help us with this responsibility by visiting our facility only when you are well. If you are ill, or recently have been ill, please do not visit the Terrace. Adults over the age of 65 are more susceptible to complications from the flu; these complications can include life-threatening respiratory issues. Thank you for considering our residents and respecting this request. We wish you good health, and hope to see you soon. Our Shenandoah Terrace activities program is designed to provide more than just entertainment. While we love to see residents enjoying themselves, we also prioritize health, safety, and brain support when planning activities. With options for individual and group participation, we tailor our offerings to engage as many residents as possible. Ambiance is an important part of our activities at the Terrace. 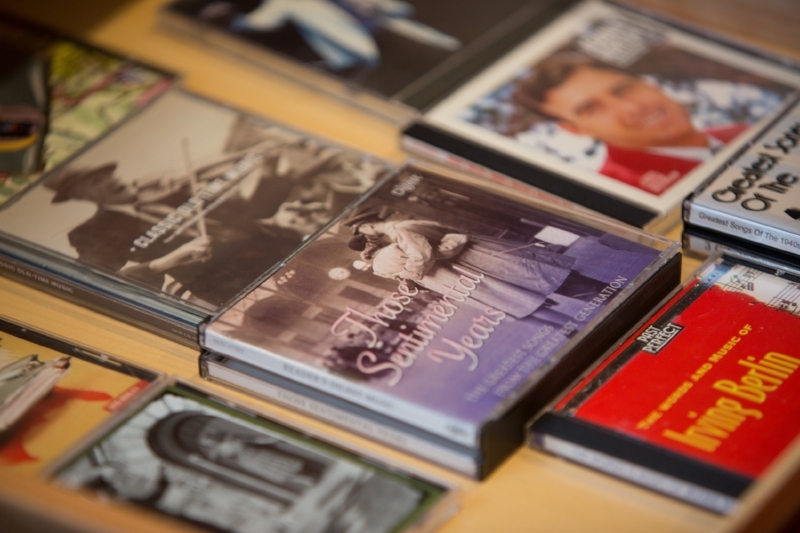 Our staff constantly plays pleasant music that may evoke memories for some of our residents. Selections from the 1940’s and 50’s are our go-to; we play Johnny Horton, Roger Whittaker, and compilations of hit songs. The music plays while our residents pursue activities of their own choosing. For some, daily living skills like sorting and folding are relaxing. Others enjoy card games, crafting, and conversation. 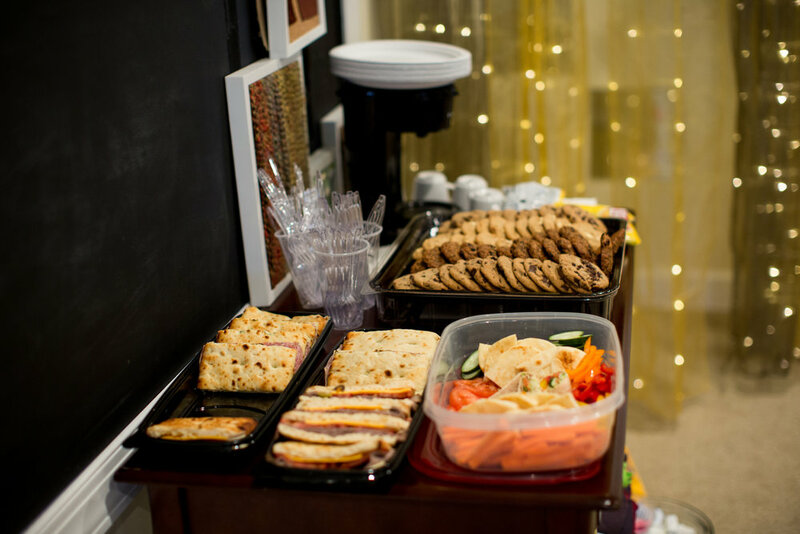 More involved activities take place in our resident-adapted kitchen, where we stir up memories along with delicious treats. From preparation and aroma to taste and cleanup, many aspects of the cooking process allow residents to reminisce. We enjoy guiding their kitchen activities, too. Our staff helped residents bake festive cookies throughout the holiday season, and recently assisted with cinnamon sugar doughnuts. These are just a few examples of how we incorporate meaningful activities at the Terrace. Every day, we do lots of small things that can add up to a big benefit for our residents. As we add to our repertoire, we’ll keep you updated about the new activities we have planned. We’re fond of saying that Shenandoah Terrace feels like home for its residents. In part, that’s because of our compassionate staff, our comfortable rooms, and our community-building activities. But, we also benefit from the help of New Century Hospice, a great organization that is often on site. Their approach to care is built on five principles that we appreciate: comfort, dignity, compassion, integrity, and hope. To improve the lives of our residents, the New Century Hospice staff treats them just as they would in-home hospice patients. Residents receive services such as spiritual counseling, medical social services, and speech and other therapies, as appropriate. Loved ones of our residents are also eligible for New Century’s assistance. They can work with hospice on everything from dietary concerns and medical equipment to support groups and counseling. The company’s goal is to help residents and their loved ones “embrace each of life’s moments to their fullest.” Staff member Christal Yowell, who spoke with us for this newsletter, plans fun monthly activities that residents always enjoy. Another staffer, Suzanne, is known for her thought provoking conversations. New Century offers chaplain services, too. Our residents look forward to their cleric’s visits, which happen two Wednesdays each month. The cost of most of New Century’s services is covered by the Medicare Hospice benefit. Private insurers may also cover some of their services. For more information about this important part of our community, please visit www.newcenturyhospice.com. We’re grateful for their compassionate presence. Our staff has enjoyed helping residents settle in at Shenandoah Terrace. We love learning more about our residents, and using that information to brighten their days. This month, we would like your help to gather information. Do you know of springtime traditions that your family member at the Terrace has enjoyed? Whether it’s a favorite Easter hymn, a seasonal recipe, or a beloved activity, we want to hear about it! Please send us suggestions. We will incorporate your ideas into the lives of our residents. Thank you in advance for contributing to a happy first Spring at Shenandoah Terrace. Carter Properties is pleased to announce the opening of Shenandoah Terrace, a state-of-the-art memory care community. The 21-room facility will provide a safe and inviting home for individuals living with various forms of dementia. 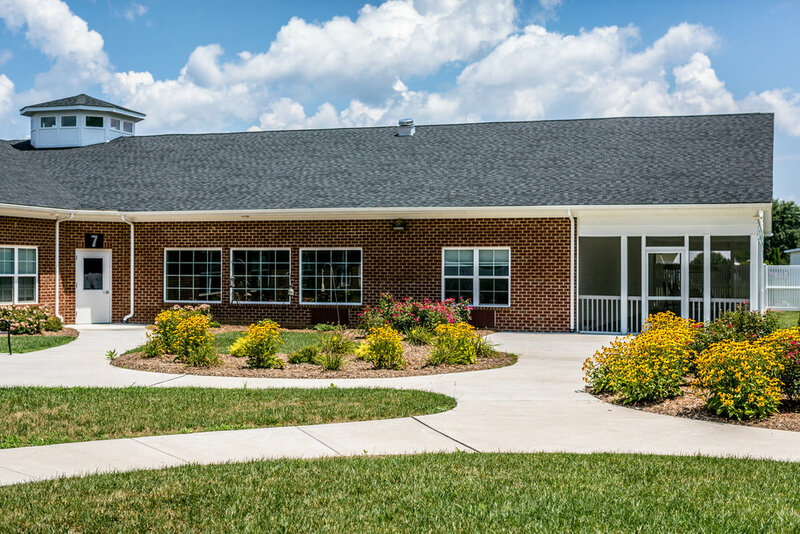 Located in New Market, VA, Shenandoah Terrace complements the company's nearby assisted living facility, Shenandoah Place. Shenandoah Terrace is designed to promote the psychosocial and physical well being of its residents. With amenities from a beauty salon and barbershop to a resident-adapted kitchen and therapeutic sensory room, the facility combines comfort and innovation. Outdoor living includes secure walking paths and wide porches overlooking attractive landscaping. Throughout the facility a full-time nurse and well-trained staff administer careful, compassionate care. "We're proud to have planned a community that's as beautiful as it is functional," Paul Griffin, the facility's co-owner, says. "Our hope is that residents will feel like the Terrace is truly their home. We think it's important to accommodate individual abilities and needs, but we're also excited to see a real community grow here." Co-owner Mark Griffin adds, “Combining a wonderful space, excellent care, and very competitive rates will create remarkable value for comprehensive memory care. We're looking forward to showing our residents all that their new home has to offer." As a dedicated memory care community in the Shenandoah Valley, Shenandoah Terrace will fill a local need for specialized care. "With experience, research, and compassion to guide us," Paul says, "we can positively impact the lives of residents and their loved ones at Shenandoah Terrace." For more information about the facility, or to discuss opportunities for residency, please visit www.shenterrace.com, or call 540-740-8600. Carter Properties, a family business comprised of Marvin Griffin and his sons, Paul and Mark, owns and operates assisted living and memory care facilities in the Shenandoah Valley. The family opened Shenandoah Place in September 2006. 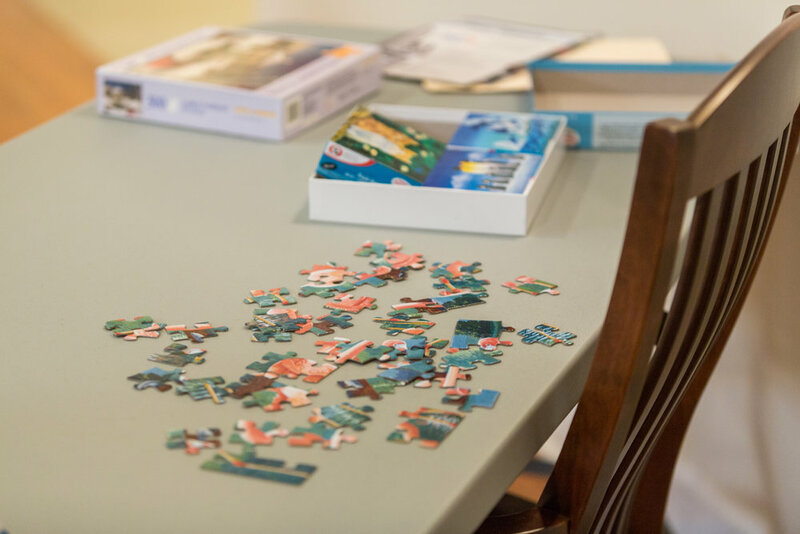 The success of that endeavor, as well as their experiences with residents in need of memory care, led them to plan Shenandoah Terrace beginning in 2015. Here's a different sort of update: instead of telling you about construction progress, we'd just like to share photos of Shenandoah Terrace's first snow. Our site looks pretty different under mounds of the white stuff! We hope you enjoy. Happy 2016 from Shenandoah Terrace! We're thrilled to report that the new year has brought new progress to our building site. As you can see from these photos, our windows have been installed, and our entire roof is in place. With so many construction tasks checked off, we are excited to enter the final phases of building. In fact, we expect the Terrace to be finished and ready to open later this spring! As excited as we are about our new building, we are even more eager to meet the new residents who will help make it such a special place. We are now accepting applications for residency. For information on how to apply, please see our website or contact one of us directly! Thanks for reading. We love the stories behind each of our Shenandoah Terrace construction updates. It was fun to celebrate the groundbreaking, and wonderful to see the building site fill with workers and equipment. We have to say, though: this might be our most exciting post yet. Recently, construction on the building itself began, and we can see our plans for the Terrace coming to life! Since our last update, the walls of Shenandoah Terrace have been framed, and the trusses are going up now. The pictures give a real preview of the building's design, and it looks even better on the lot than it did on paper. We'll be sure to update you again as construction continues to progress. In the meantime, take a look at the rest of our website, and don't hesitate to contact us if you have any questions about Shenandoah Terrace. Summer may be winding down in the Valley, but we’re pleased to report that our Shenandoah Terrace construction site is just picking up steam! The lot where we recently broke ground is now full of trucks, building supplies, and busy workers. We hope you enjoy this sneak peek at the progress we’ve made, and look forward to sharing more updates as we move forward. Until last week, the new Shenandoah Terrace site looked like a plain, grassy lot. It was a nice lot, sure, with lovely trees nearby and blue skies overhead, but there were few signs of dramatic change in its future. Mere miles from the lot, though, plans were well underway for the construction of Shenandoah Terrace. And on May 26, the changes officially began over at the site. That afternoon, we gathered a small crowd to proudly break ground on our new building! Along with their guests, we were pleased to host officials from the town of New Market, staff from Shenandoah Place, and representatives from BB&T and Evermore Construction, among others. It was a beautiful afternoon. Owners Marvin Griffin, Mark Griffin, and Paul Griffin manned the shovels, while Pastor Buz Menhardt said a prayer for the project. We celebrated with cookies and conversation, and also enjoyed a thoughtful "thank you" speech from Paul. Our three shovels were a wonderful beginning for Shenandoah Terrace construction, but they're just the tip of the iceberg. During the groundbreaking, a skid-steer loader waited nearby to continue the job, while attendees had a look at the detailed plans for our facility. We are thrilled that Shenandoah Terrace is taking shape, and look forward to updating you on the progress of construction. Please check back frequently for news as the building process moves forward. Professional photographs of the groundbreaking were taken by Swartz Photography.